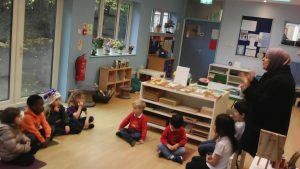 Throughout the year as part of the curriculum the children of Rainbow learn about different festivals and celebrations from different religions from around the world. On Tuesday, 20th November the children of Elementary 1 and Elementary 2 enjoyed a visit from Rim, Hadi and Lilia's mum. Rim spoke to the children about the Muslim festival of 'Milad' also called 'Mawlid al-Nabi'. 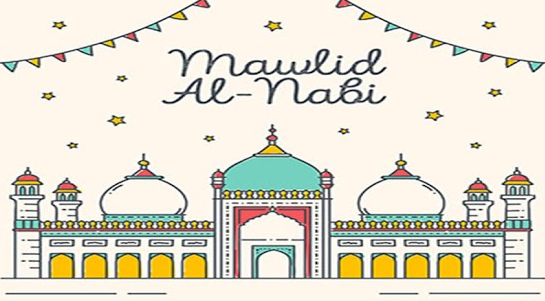 Mawlid (or Milad) means 'birth of the prophet' and refers to the birthday of Muhammad. Rim shared with the children how families celebrate Milad by remembering the importance of mercy to be showed towards everyone and they prepare lovely deserts with dates to share during the family gatherings. We also found out that families who celebrate decorate their homes and go for public processions. 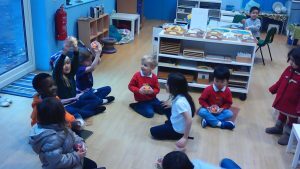 All the children received beautiful mini gifts: a mandarin, a strawberry, dates and raisins packed in a star decorated box and the children showed great interest in learning about this festival and loved getting a little special treat. A big thank you to Lilia and Hadi and their mum Rim! 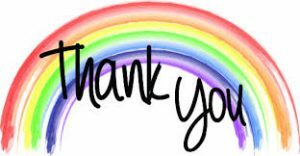 If you would like to share any festival with the children, please feel free to get in touch with us. 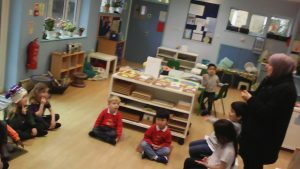 The children always love having special guest and we look forward to hearing from you.